Former President George H.W. 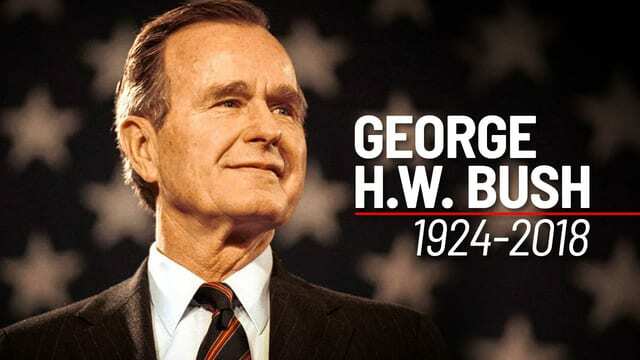 Bush passed away at age 94. The death of a prominent national figure, especially a former President of the United States, is always a tragic event. On Friday, November 30, George H.W. Bush, the 41st president and father of the 43rd, passed away late in the night at the age of 94. Bush was diagnosed with Parkinson’s Disease several years ago, and his health had been declining ever since. His death came only eight months after the passing of his wife, Barbara Bush. Bush was considered a skilled politician not only by his fellow members of the Republican party, but also by many Americans. His career both before and after his presidency provides examples of his political prowess. Bush was born in Milton, Massachusetts and later moved to Greenwich, Connecticut, where his father was a state senator. Early in his life, Bush joined the United States Navy and became a pilot who fought in World War II. Following the war, Bush married and had six children, including George W. Bush, 43rd President of the United States, and moved his family to Midland, Texas. Bush’s career as a politician took off following his move to Texas. Over time, Bush would serve in the House of Representatives for Texas, as President Richard Nixon’s U.S. ambassador to the United Nations, President Ford’s U.S. envoy to the People’s Republic of China and Director of Central Intelligence, and President Reagan’s Vice President. After his election to the presidency in 1988, Bush implemented many reforms, including the Americans with Disabilities Act and the Clean Air Act. Some of his largest achievements were in foreign affairs, as he helped end the Cold War between the Soviet Union and the United States peacefully and handled the fall of the Soviet Union with humility. He also helped unify Germany in the North Atlantic Trade Organization alliance after the fall of the Berlin Wall. Bush supported efforts to create peace between the United States and other nations in the Middle East and with Saddam Hussein. The Gulf War was also a prominent global issue during his presidency. Memorial services for the former president began in Washington D.C. on Monday, December 3 and will continue until Thursday, December 6, where he will be taken to Texas. On Wednesday, December 5, the nation will be able to watch a funeral service on live television at 11 a.m. on major television networks. Several eulogies will be given, including one by former President George W. Bush. A smaller funeral service will be held at St. Martin’s Episcopal Church in Houston, Texas. Bush will be buried at the George H.W. Bush Presidential Library in College Station, Texas, where his late wife and daughter Robin are buried.